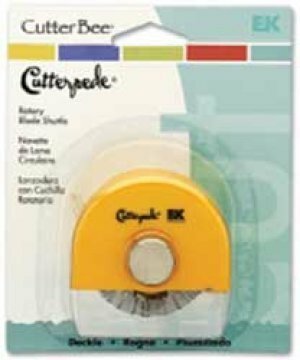 Deckle Blade - Cutterpede Decorative Edge Rotary Blade Shuttles. Great for use with both the standard sized Cutterpede EKCPO1 and the Cutterpede Mini EKCP02. The shuttles have designs on the outside for easy paper alignment. Ideal for trimming photos and mats. Create borders, edges, and more!